L-Carnitine is an important amino acid with a critical role facilitating the uptake of fatty acids into mitochondria for energy production. Cardiac muscle is rich in L-Carnitine, and inadequate amounts can affect this organ early on. Supplemental L-Carnitine supports normal myocardial energy production, stable cardiac rhythm, and normal oxygenation of myocardial and other tissues. 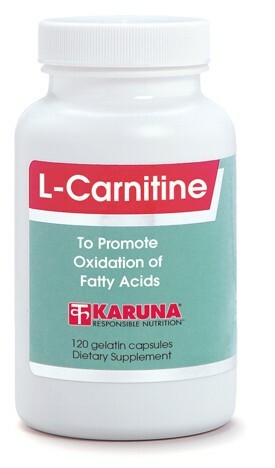 L-Carnitine is required for long-chain fatty acid oxidation and is critical for muscle bioenergetics (J Am Coll Nutr 1998;17:207-15). Supplemental L-Carnitine may promote normal energy production, cardiovascular function, and lipid and glucose metabolism (Altern Med Rev 1998;3:345-60). Carnitine deficiency has been assoc-iated with conditions of impaired oxygen delivery (Lancet 1988;2:337; Cardiovasc Res 2001;51:21-9) and other chronic physiological impairments (J Diabetes Complications 1999;13:251-3). L-Carnitine supplements support maintenance of normal heart rhythm and overall function (Minerva Med 1989;80:227-31). Numerous studies indicate that L-Carnitine supplementation supports long-term myocardial health (Postgrad Med J 1996;72:45-50; J Am Coll Cardiol 1995;26:380-7; Drugs Exp Clin Res 1992;18:355-65). Suggested use for adults: Four capsules per day, in divided doses between meals, or as directed.